Hotel Ritz. For a luxurious treat stay at the Ritz – an institution from 1910. You can book it here. TriCiclo. A wonderful restaurant with charming interior and tasty creative dishes ranging from grilled oysters to guinea fowl. Botín. Listed in the Guinness Book of Records, this restaurant is the oldest one in the world. It serves delicious dishes such as artichokes with grilled Iberian ham or suckling pig. Museo del Jamón. With dozens of hams dangling from the ceiling, the restaurants of Museo del Jamón offer simple dishes in a funny surrounding. Locals come for bocadillos, tortillas and daily menus. Los Galayos. Traditional restaurant right at Plaza Mayor serving classical Paella, oxtail stew and more. Mercado de San Miguel. Here you get modern food experience within a traditional market atmosphere. There are a lot of tapas to try at the stalls. As Madrid is a big city, the hop on tourist buses (running on two routes) can become handy – the two-day tickets cost only 4€ more. Museo del Prado. This famous museum, hosting paintings of Velasquez, Goya and Rubens, has impressive interiors and offers free entry every evening. The extension was done by architect Rafael Moneo. Museo Reina Sofia. This museum features masterworks by Salvador Dalí, Georges Braque and Pablo Picasso, whose "Guernica" can be found on the second floor. The museum has an extension designed by architect Jean Nouvel. Museo Thyssen-Bornemisza. This museum features art from the 13th century to the late 20th century with artists like Edgar Degas, Edward Hopper and Vincent van Gogh. It was designed by architect Rafael Moneo. Palacio Real. 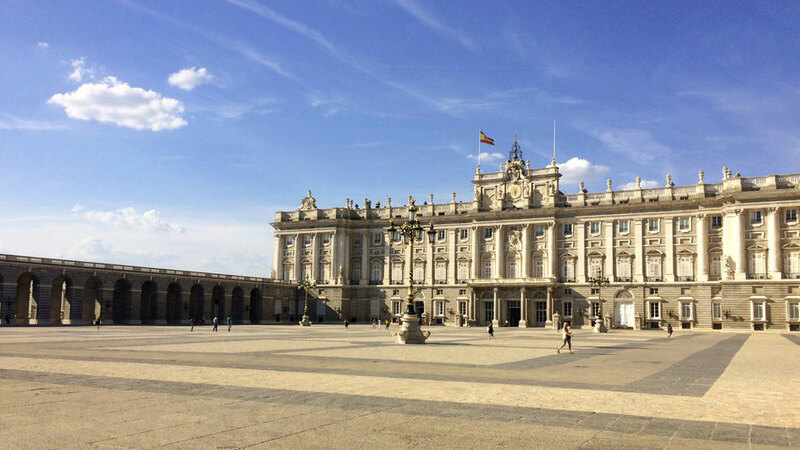 A visit to the Royal Palace in Madrid is a great experience, especially with an audio guide describing the pompous chambers. Caixa Forum. The sociocultural center was designed by Swiss architects Herzog & de Meuron and features changing exhibitions. The building floats next to a green facade and has two impressive staircases inside. Salamanca is a pretty area to do some shopping. The Jardín de Serrano has nice shops like Sebago (shoes for gentlemen) or the pretty Sofia Paper Store. Cartujano. If looking for luxurious Spanish leather products, visit Cartujano‘s boutique with its hand-made products. Toni Pons. Here you can find a nice collection of Espadrilles – Spanish sandals – in many many colors and models.